Wondering how to convert your future exit into a bigger payday? 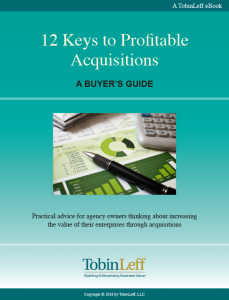 This White Paper explains a core group of Value Driver principles and some specific strategic goals you can adopt today to increase the price you receive when you sell tomorrow. Do you really know the facts regarding your exit plan? This informational chart reveals 9 common myths you may have heard about Exit Planning and how they hold up to reality. You should be laying the groundwork for your exit 5 to 10 years before you plan to transfer ownership or retire. Here’s why. Life after the agency business: What’s your next chapter? Please complete the form below to gain access to our growing list of curated resources.